Organic by John Patrick is a brand that believes that style and ethical practices can live in harmony in the fashion world. It knows that what it’s doing is right and won’t conform to the methods that most labels use in garment production just because it’s more conventional and cost effective. In a way, Organic is being rebellious and stubborn about what they believe in and won’t back down until other brands start adapting the same methods, eventually making ethically produced clothes the norm. The confident attitude of the brand was the main focus of my print campaign which consists of three double sided posters. The phrases “Disrupt the Balance,” “Redefine the Rules,” and “Why Be Ordinary?” are bold statements illustrating this attitude and vision, which hint at the idea of a revolution to change standards and question society. 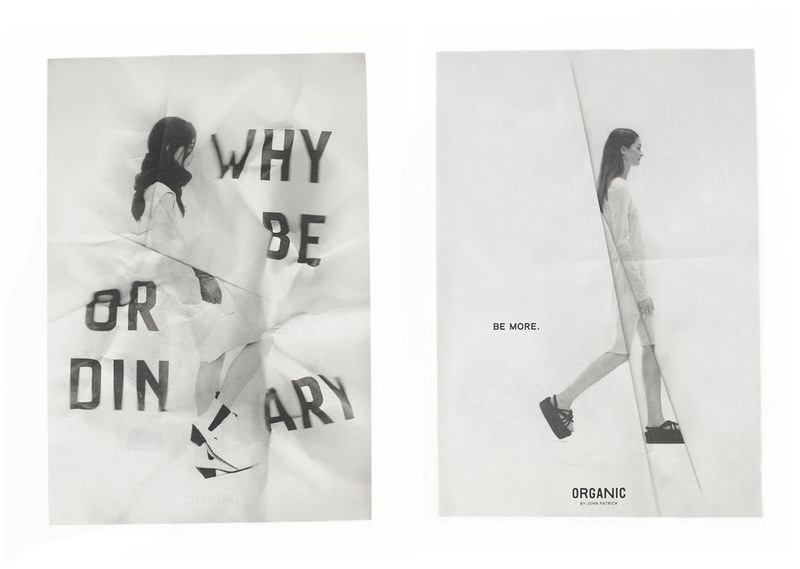 On the back of each poster there is another girl joined by the simple phrase “Be more.” While the message is meant to be open ended, the underlying meaning is to expect more, want more, and demand more from life. These poster ads are inserted into high end magazines like Vogue, Elle, and others that are geared towards the fashion world. Within the magazine, the contrast between the glossy, richly colored photos and the rough black & white newsprint posters serves to reference the concept of doing things your way and not conforming to standards.